"The most accurate and most credible historical fact has Don Carlos Antonio Lopez (according to Paraguayan historians, the founder of the Paraguayan State, governor of his country between 1841 and 1862) and one of his cooks (called "machú" in Guarani language) as main characters. It is told that the great governor, a really obese man, liked the "tykuetî" or white soup elaborated with milk, Paraguay cheese (fresh cheese), egg and corn flour. One day, on an involuntary mistake, the machú put too much corn flour to the mixture. Near the noon, she found herself with two problems: first, that wasn’t the base mixture for the tykuetî; and second, she didn't have time to start over the process, or replace the favorite dish with another. 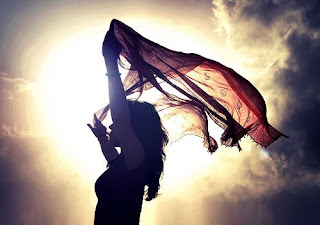 So, showing off a decided attitude, a mix of fear and wit, she poured the mixture on an iron container and cooked it in the "tatakua" (the Guarani word for "hole of fire", a rustic oven made of clay and adobe), from which she obtained a solid soup. Don Carlos, after tasting it, found it very delicious and immediately named it "sopa paraguaya". In some places it is also called "Paraguay Soup"." Now, my favorite recipe for this delicious cake-like bread. Put all of the ingredients into a blender and blend for a while. Pour the mixture into a 9"x13" (or a little smaller) greased baking pan and bake at low heat for 45 minutes. Turn off the oven and leave the oven door slightly open and let the sopa cool down for about an hour. This bread is great for eating with soup or like we do with a barbeque. Or just make it for a light lunch or supper! Hope you try it and like it. Posted by the Chacogirl at 11:08 a.m. I'll be posting a new recipe in the next few days. I have the last meeting of the craft show gang tonight, and a ladies meeting with speaker tomorrow afternoon. Hope everyone has a great week! Posted by the Chacogirl at 3:49 p.m. I just found out, that madioka-starch is called tapioca flour. I think you could probably get it in specialty food stores in the U.S.
Posted by the Chacogirl at 7:34 a.m.
One of my blogging friends asked me about typical paraguayan dishes. So I decided I would post some recipes of some of my favorites. 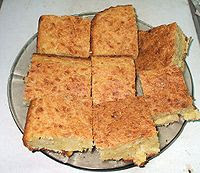 The number 1 traditional food of Paraguay would be Chipa. Put the milk, oil, cheese and eggs in the blender, blend until smooth. In a larger bowl mix together (with a large wooden spoon) the starch, salt and baking powder. Pour in the liquid ingredients and stir through until combined. Into lightly greased muffin tins, pour or if the mixture is too hard, spoon in the dough until the tin is 3/4 full. Bake at medium heat for about 15 minutes or until lightly browned. These are best eaten fresh from the oven, but also freeze well. You can pop them into an oven for reheating if you want. Posted by the Chacogirl at 10:23 a.m.